Internal Revenue Service employees got their tax reform marching orders from the Treasury Department on Thursday as the tax service released new withholding tables designed to allow taxpayers to feel the impact of tax cuts in their own paychecks. But the IRS’s budget—which has been slashed in the past six years so that training funds are down 75 percent—remains caught up in the broader congressional stalemate over fiscal 2018 funding for the government. And in her annual report released on Wednesday, National Taxpayer Advocate Nina Olson decried both the declining funding amid heightened workload and the poor dollar returns on Congress’s much-touted mandate that the agency contract with private debt collectors. The new withholding tables reflect the increase in the standard deduction, repeal of personal exemptions and changes in tax rates and brackets, the IRS said. The agency “appreciates the help from the payroll community working with us on these important changes,” said acting IRS Commissioner David Kautter. “Payroll withholding can be complicated, and the needs of taxpayers vary based on their personal financial situation. In the weeks ahead, the IRS will be providing more information to help people understand and review these changes." Both Treasury and the IRS will help design a new W-4 form for next year’s filing season to be released by the end of this year. 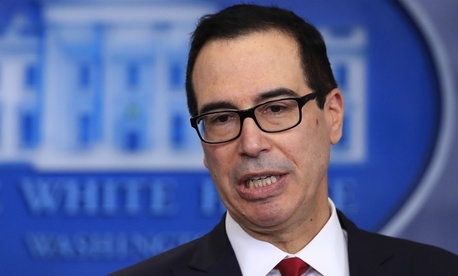 “And the IRS will continue to focus on simplification and a user-friendly process,” Mnuchin said. As Congress struggles with a fiscal 2018 governmentwide funding deadline of Jan. 19, there is some talk among key Republicans—now that their long-sought tax cuts are in law—of adding funding to the tax agency while seeking reforms. The latest appropriations bills would cut the IRS budget by $100 million, as the National Treasury Employees Union noted in a statement. After the previous tax reform in 1986, the agency changed 162 existing forms, developed 48 new forms and created 13 new publications, according to the National Taxpayer Advocate. Call volume increased by 14 percent, and the agency added 1,300 staff to increase their ability to answer questions from taxpayers and business owners,” NTEU noted. Among 21 problems the advocate identified at the IRS, she devoted particular space to reporting the agency’s required second try over the past two decades to use contractors to go after the most stubborn tax delinquents. Before requiring the new effort, lawmakers were warned by unions and consumer groups that the earlier efforts were not a success and that the methods used by non-IRS employees risked abusing vulnerable taxpayers. In fiscal 2017, IRS figures showed, the agency collected $6.7 million in payments from taxpayers whose debts were assigned to private collection agencies. But the total cost of the program was $20 million, three times the amount collected, Olson’s report noted. Chi Chi Wu, a staff attorney at National Consumer Law Center, on Thursday called the private debt collector program “the epitome of waste and abuse in government programs. Forcing the IRS to use private debt collectors to put the squeeze on vulnerable low-income families simply lines the pockets of these private collectors while jeopardizing the economic well-being of families,” she said.